As a family, we appreciate that Reunion has an unbeatable foundation in good food. Whether it’s just a burger at the water park or fine dining at Eleven or Forté, the standard of dining is always a cut above any other comparable resort area that we know. We write dining reviews for a living and it’s reassuring that Reunion, the place we made home from home, delivers 5 stars so comfortably when it comes to great cuisine. This week, the November issue of ‘Gatherings’ depicts a really tasty upgrade from Director of Food & Beverage, Robert Mason. • Barbequed Bacon Shrimp – Bacon and Fresh Basil wrapped Jumbo Shrimp, local BBQ Sauce. • Filet Mignon Egg Roll – Melon, Jicama slaw, Sweet Chili Sauce. • Bronzed Grouper – Lightly Blackened Florida Grouper, Lobster and Shrimp Ragu, Grilled Asparagus, Orange Cajun Sauce, organic Grits. I think that the overhaul of the Eleven menu is a little overdue, but credit to Robert, the Food & Beverage team have hit well above target looking at the tempting menu. We will of course check the items out and post full reviews asap. The Clubhouse also gets an update Mid November and again, regular guests will very much appreciate the update with new appetizers, salads and entrees, such as Coconut Shrimp, Crap Dip, Caprese Salad, Cowboy Burger and Bacon Pepper Pork Tenderloin. Forté also looks set for some updates later in November, but I hope those zucchini chips still make the cut! Expect to see Antipasto, Minestrone Soup, Polenta Crusted Scallops and Pollo con Fungi. Thanksgiving Dining is worth considering and there’s an abundance of choice at the various resort restaurants, including the clubhouse and ‘Reunion To Go’. 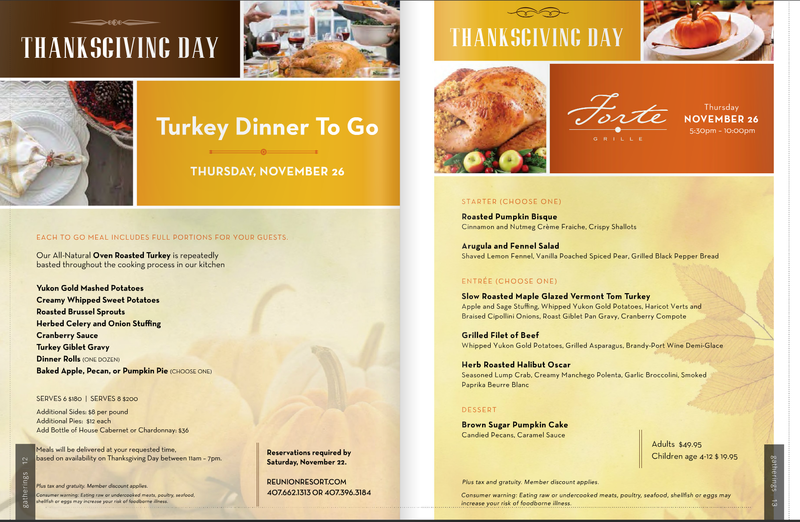 Click here to view the full November Gatherings edition, complete with menu details for Thanksgiving! Previous We bumped into P Diddy Tonight!